Sam Slobodian was born on May 1, 1954 to Ukrainian missionaries, Peter and Mary Slobodian, in Saenz Pena, Argentina. Although he had come to the United States at the age of three, he did not have a real introduction to the English language until his first day of kindergarten. As young children do, Sam learned the language quickly and one of his more vivid memories of those days was the time his father came home with a small green AM radio. The idea was that somehow the knowledge of the English language would be imparted to the immigrant family as they huddled around the radio and listened to it in their small but very clean fourth-floor apartment, located in a run-down neighborhood of Minneapolis, Minnesota. Childhood for Sam and his sisters, Ann and Debbie, was quite normal and saturated with church activities since their parents began establishing Ukrainian and Russian Baptist churches to reach the Slavic population of Minneapolis while they both were studying at University of Northwestern – St. Paul and Central Baptist Theological Seminary. When Sam was ten, he began to do some serious thinking after his Daily Vacation Bible School teacher asked each boy in the class to give not only the date of his birth but also the date he was born again, his spiritual birthday. Having been raised in a preacher’s home and having heard the Gospel preached continually, Sam reasoned that he must have been saved at some point, even if he could remember neither the date nor the circumstances surrounding his decision. However, the Holy Spirit soon convicted Sam that the reason he could not remember anything about this event was that it had never happened! And so by the end of the week Sam received Christ as his personal Savior and wrote the date down in his Bible: June 24, 1964. When Sam was twelve, his family moved to Chicago, Illinois. Having completed their studies in Minneapolis, Sam’s parents were drawn to Chicago by the opportunity of ministering to the huge Slavic population of the city. Though he was not thrilled with spending Saturdays in a Ukrainian grammar school, looking back it seems that even in those days God was preparing Sam for his future ministry. As a dedicated Christian young man growing up in Chicago, Sam was active in church and youth activities and had an effective witness for Christ in addition to always managing to find employment. Even though Sam earned academic honors in high school, being named an Illinois State Scholar, his main interest was trumpet, which he hoped to pursue professionally. Sam became a serious musician and eventually was recognized as one of the outstanding high school musicians of the city. After high school, Sam served as the youth pastor for East Maine Baptist Church in Glenview, a northwest suburb of Chicago. The youth group multiplied under his ministry, and he involved many of the youth in the soul winning and bus ministries, starting several new bus routes During this time, Sam attended Northeastern Illinois University, where he earned a bachelor’s degree. Feeling the need for theological training and preparation, Sam resigned the youth ministry at East Maine in order to attend Central Baptist Theological Seminary, where he earned a Master of Divinity. While a student there, Sam served as the first assistant pastor of the Valley Baptist Church in Golden Valley, Minnesota, where he developed the youth ministry into an extremely active program featuring camps, retreats, and cross-country bus trips. Eventually brother Sam earned a Doctor of Missiology Degree from Trinity Evangelical Divinity School in Deerfield, Illinois. While at Central Baptist Seminary, Sam met Amy Lindner, whose family attended Fourth Baptist Church, which housed the seminary. Amy, too, had grown up in a Christian home, where she was saved at the age of 10 as a result of evangelistic meetings in her home church in Littleton, Colorado. Amy attended Pillsbury Baptist Bible College, and after they were married she completed her education at Hyles-Anderson College, where she earned a bachelor’s degree in elementary education. Amy and Sam were married on June 6, 1977. After Sam’s graduation from seminary, they immediately moved to Chicago, where Sam had been called as pastor of Southside Baptist Church of Chicago. Sam and Amy devoted themselves completely to the inner-city work and God blessed with a harvest of souls and a wonderful congregation of loving people. After three fruitful years, Sam led the church in a move to the southwest suburb of Oak Lawn, where the church had already started a Christian day school. This proved to be an excellent move for the church and the school soon numbered over 300 students. 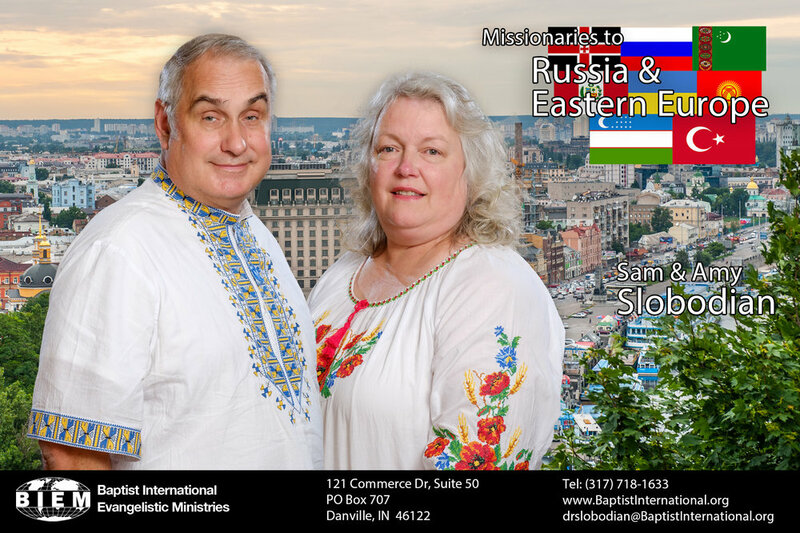 In 1982 Sam became increasingly burdened and challenged by the ministry (Baptist International Evangelistic Ministries- BIEM) that he and his father had established the previous year to reach behind the Iron Curtain. This burden and challenge continued to grow to the point where it was evident that this was the calling of God to leave the pastorate in order to serve as a missionary with BIEM reaching Russia and Eastern Europe. In 1990 dramatic changes came to the ministry of BIEM with the advent of glasnost and perestroika in the Soviet Union. The collapse of Communism resulted in many new opportunities for ministry in Russia and led Sam and Amy to consider moving there. Discussing the matter with BIEM’s board and with others with longtime involvement with the Slobodians and BIEM, both in Russia and the West, helped Sam conclude that they would be most effective operating from the United States. Today Sam serves as president of BIEM, and Amy works in the ministry's office. BIEM specializes in Russia and Eastern Europe, where the mission has planted numerous churches by supporting, training, and equipping nationals. BIEM also distributes Bibles and Gospel literature; maintains a seminary in Kyiv, Ukraine; translates and prints discipleship and pastoral training materials; conducts evangelistic outreach ministries; sponsors Christian summer camps for children and youth; provides material aid; and helps new congregations to build churches. In 1993 the Slobodian family moved to Indianapolis, Indiana, to establish a new office for BIEM. God has greatly blessed this move and the ministry has steadily expanded. The Slobodians are members of Mt Tabor Baptist Church of Lebanon, Indiana, and have 5 children: Sarah, Susan, Steven, Sharon, and Stephanie. Susan married Mat Harvey in 2007; Sarah married Nathan Crouch in 2007; Stephanie married Aaron Anger in 2011; and Sharon married Ashton Brandyberry in 2012. 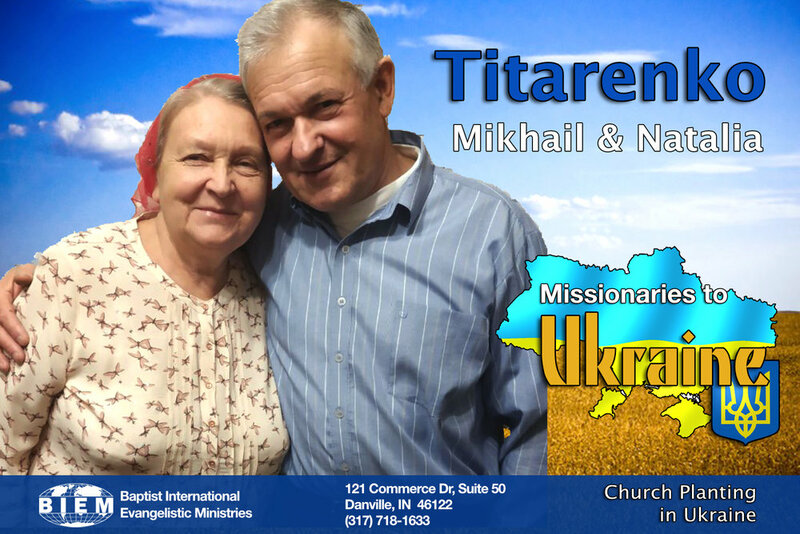 Vitaly and Katerina Bilyak are Ukrainian national missionaries to the western part of Ukraine in the city of Ternopil. They have three children, Karina, David, and Mark. My parents are Christians of deep faith. From childhood I have known much about God, but as I grew up, the idea of being a Christian pleased me less. I preferred to live according to my own pleasures. I enjoyed being with my own friends. In time I began to lead a double life. On one hand I wanted to be a good son; but on the other a “hip” friend. At first everything worked out the way I wanted, but in time it became harder to live the double life. Everyone knew that I had a Christian family. I never hid this and was not ashamed of it. I was never in the “Octobrists” or the “Young Pioneers” [Communist clubs for school children]. And because of that I experienced various gibes and mockery. But when I went to church, I could not feel like a genuine Christian. What’s more, as time passed, I grew farther apart from my friends and from the church. Besides that, I began to see that I could not be a good person on my own. The more I desired not to sin, the less successful I was at this. Our pastor almost always ended with an invitation to repentance. I began to feel the crucial importance of this. But I could not imagine life without my unchristian friends. In order to not hear the pastor’s invitation, I began to slip out of church services 15-20 minutes before the end of his sermons. For a short time this “solved” the problem. But God continued to knock at my heart. And one time I opened it to Him. In 1992 I was baptized. Christ was victorious. Now, looking back, I see that the Lord was drawing me to Himself. “No man can come to me, except the Father which hath sent me draw him” (John 6:44). In 1993 I went into the army. I ended up serving much of my duty in the south of Ternopilskaya oblast near the town of Skala-Podolskaya (Borschovsky region). When I was permitted, I went several times to worship services in the city of Kamenets-Podolsky, which was 60 km away (Khmelnitskaya oblast). All my time in the army I tried to find there (in that general region) evangelical [non-Russian Orthodox] Christians. Here are results of my almost year-and-a-half long searches. In Skala-Podolskaya (population 5000 as of 2003) there were no believers; in the city of Borschov (population 12000) there were 3-5 Pentecostals who visited the small Pentecostal church in the village of Mushkativka, which consisted 80% of grandmothers of retirement age. But life went on. I took part in the work in my own church, I fulfilled various ministries: was involved in the Christian library ministry, sang in the choir, preached, and was later the youth leader in the church. My last ministry was to be responsible for the youth in independent churches of the western region. At various times the Lord reminded me about Ternopil oblast, but at that time I was not able to do it. During this time I became a dentist and got married on July 14, 2001, to a wonderful, humble girl named Katya. I also completed my studies in the Kyiv Theological Seminary. That is when God specifically called us to the full-time Christian ministry of church planting in Ternopilskaya oblast. After that decision, we began to gather information about Ternopilskaya oblast. Everything that we learned strengthened us even more for this direction. Under the Bilyaks' guidance, a church has grown up in the city of Ternopil. The congregation is actively engaged in evangelism, youth ministries, runs a Christian rehabilitation center, and now owns their own building! Praise God! Eugene Buyko (who also goes by the nickname “Zhenya”) oversees BIEM’s team of church planters and children’s workers in Ukraine. He has been instrumental in helping church planters to get established even in difficult areas, and he frequently preaches in their churches and joins them in evangelistic outreaches. In addition to ministering the Word of God, Eugene is exceptionally gifted in navigating governmental bureaucratic requirements and processing paperwork connected with such projects as receiving 40-ft. containers of humanitarian aid, purchasing a building on a military base for a church, and establishing our homeless children’s ministry. Every summer Eugene organizes BIEM’s Ukrainian camping program, which involves over 800 campers in several camps. As BIEM’s director in Ukraine, Eugene is able to offer an excellent overview of Christian ministry in this corner of the former Soviet Union. Andrei serves as Director of the Christian Rehabilitation Center located just outside Ternopil, Ukraine. In this role, he and his fellow ministers at the center have been used of God to free men from their dependencies on drugs and alcohol. Even more important, the Lord has blessed them with opportunities to free men from the bonds of sin and to lead them to new life in Jesus Christ! Anna doesn't work directly with the rehabilitates, but supports her husband in this ministry and is involved in their local church. For more information about the Eliseevs and their ministry, please contact our office. Igor and his wife Alexandra originally served with BIEM in the military town of Goncharivske, some 20 miles farther north. But when the position of pastor opened in Desna and the church invited him, Igor felt this was God's call for him to minister in the area where he formerly lived. He and Alexandra moved to Desna, where they continue to minister in that church. The Fomichovs have two children, a daughter named Anna and a son, Daniel. Please pray for the Fomichovs as they lead this congregation in evangelism and discipleship. Brother Anatoly Kosyanchuk has played key roles in multiple churches in Ukraine. He was largely responsible for planting two churches in the neighboring towns of Borivka and Komarivka. Each of those communities now has a church building and ongoing services. Meanwhile, Anatoly has accepted leadership for the first Baptist church in Bilogorodka. With God’s help, and thanks in part to Anatoly’s vision for church planting, yet another church has been planted on the opposite side of that town! So, although Anatoly still oversees and participates in the ministries in Borivka and Komarivka, others now minister weekly in those churches, and the Lord has expanded the Kosyanchuks’ labors to include other ministries for adults and children in Bilogorodka. 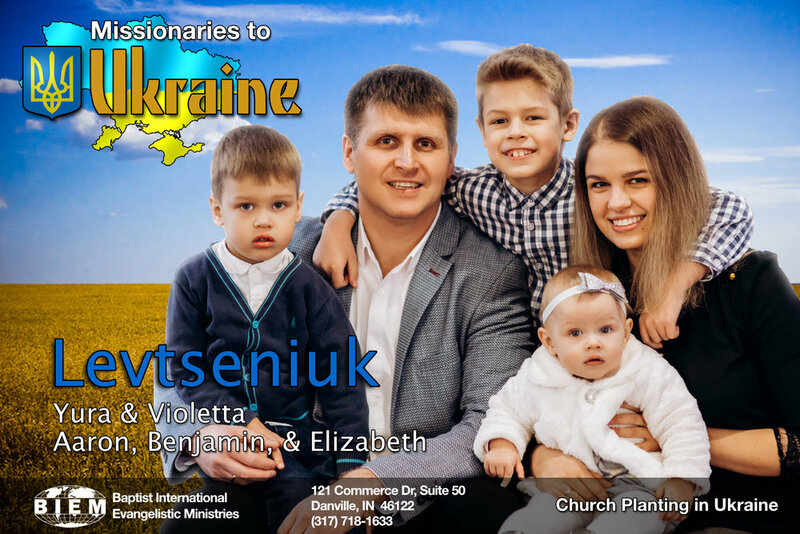 Yura, Violetta, Aaron, Benjamin, and Elizabeth Levtseniuk have been called into ministry in the city of Lvov in western Ukraine, where Yura pastors Salvation Baptist Church. In the excerpt below, Yura shares the story of how God called him and his wife into ministry. “Before telling about the ministry in Lvov, I’ll share how the Lord called us here. God called me to serious ministry to unbelievers, to people seeking God, and to church members. I began with ministry to children and teens, then to youth and adults. I’ve been serving thus for some years already. I’d recognized my great need for understanding theology and practical disciplines. I saw my lack of knowledge of the Bible despite the fact that I’d been reading and studying it since childhood. For these specific reasons, I enrolled in Bible college. Praise God, for the theological education I received. As a family, we were invited to join a short-term mission trip to the Far East of Russia, with the goal of revitalizing a church that had sunk into spiritual weakness. God granted us success in that mission, for which we are very thankful to Him. As a result of that, we felt God’s calling to establish a new church for Christ. The Petrenkos serve as church planters in Goncharovsk, Ukraine, a town that is known primarily for the nearby military base. Their ministry includes various ways of meeting others and getting involved in the local community, such as Bible studies, cooking classes, and organizing a local floor hockey team. In the summertime, they team up with church planters in other cities and together they run summer camps for children and teens. Brother Peterenko, along with a couple other nearby BIEM church planters, is starting a new church in the nearby town of Smolen. This will be the fourth church planted by BIEM in the Chernihiv region. 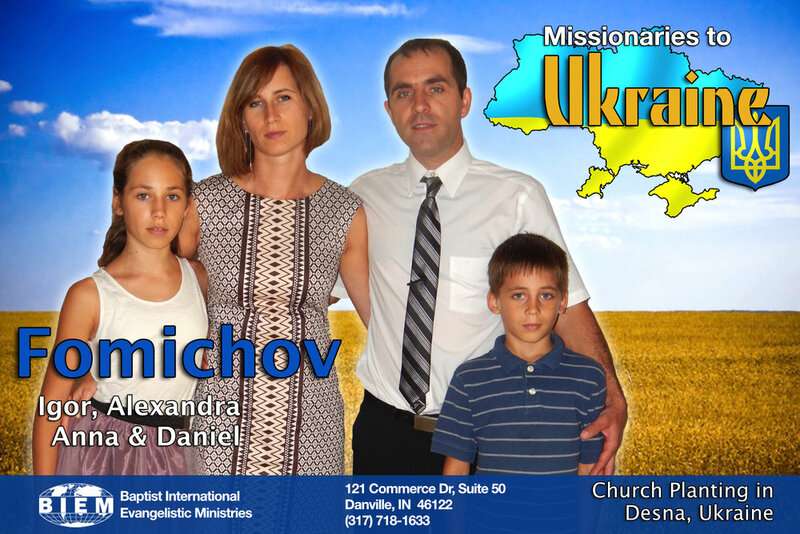 The Savchuks both came to Christ through the ministry of the church in Desna, Ukraine. They received Bible training in Kyiv and now minister in the city of Chernigov, Ukraine. Because of the thousands of university students in Chernigov, the Savchuks strive especially to meet and evangelize among the student population of their city. To this end, they offer Bible studies, English lessons, game nights, and a variety of other activities targeting the interests of university-level students. In the summer, they are also actively engaged in camp ministries for young people and children. Please pray for them as they also seek to establish a church in their area. 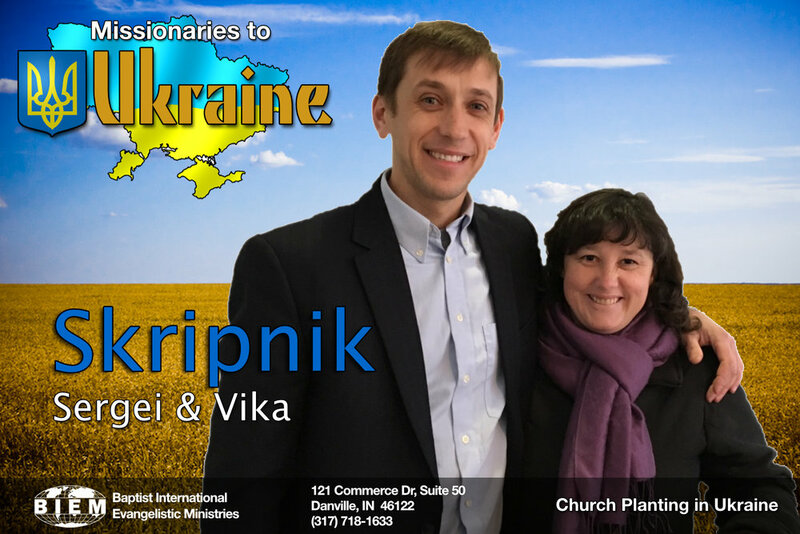 For some years, Sergei and Vika Skripnik have served as church planters among villages in western Ukraine. In addition, Vika has organized and led children’s Sunday school classes and Bible classes for public school children. Both have been involved as leaders in Christian summer camps, both in their own area and in other regions of Ukraine. Gospel ministry in villages, where local religious traditions are strong, is not always easy. But the Skripniks have been blessed of God to see souls come to Christ and lives changed for His glory. Brother Sergei also plays an important role in the training of BIEM national church planters and workers. He serves as the assistant director of Kiev Theological Seminary, the school that BIEM operates in partnership with the Brotherhood of Independent Baptist Churches of Ukraine. For more information on the Skripniks and their ministry, please contact our office. The Titarenkos relocated from the Ukrainian capital of Kyiv, to the town of Fedorivka. This town had experienced a sudden population increase when some people who were evacuated from the Chernobyl nuclear disaster in 1986 were resettled here. But because there was no Gospel witness in Fedorivka, the Titarenkos went there to plant a new church. For more information about the Titarenkos and their ministry, please contact our office. 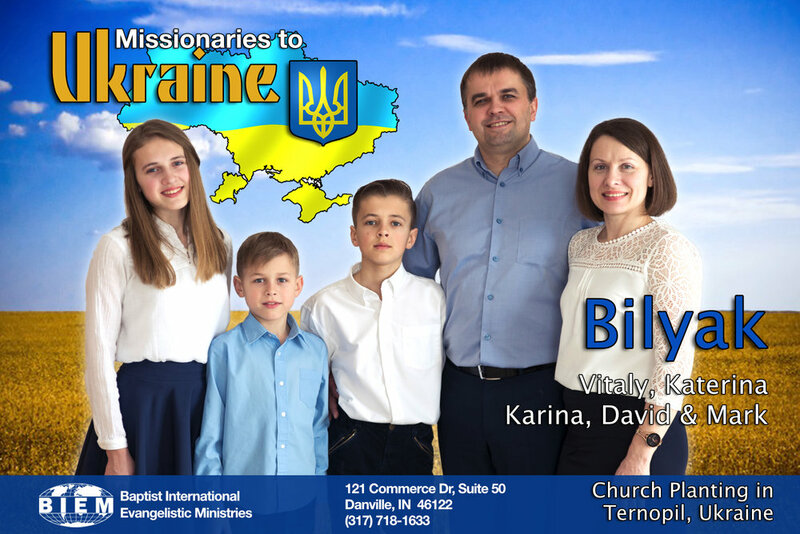 Bruce Tuttle is called to the field of Ukraine, where he lives and administrates the Pastors Training Institute of Ukraine, formerly known as International Baptist Bible College in Bila Tserkva, Ukraine. Bruce served as pastor of Victory Baptist Church in Reading, Pennsylvania, for almost 30 years before receiving his call to missionary work. He and his wife Natalie (now with the Lord) have 4 children: Micah, Matthew, Julia, and Jeffery. Natalie went home to the Lord on June 13, 2013. 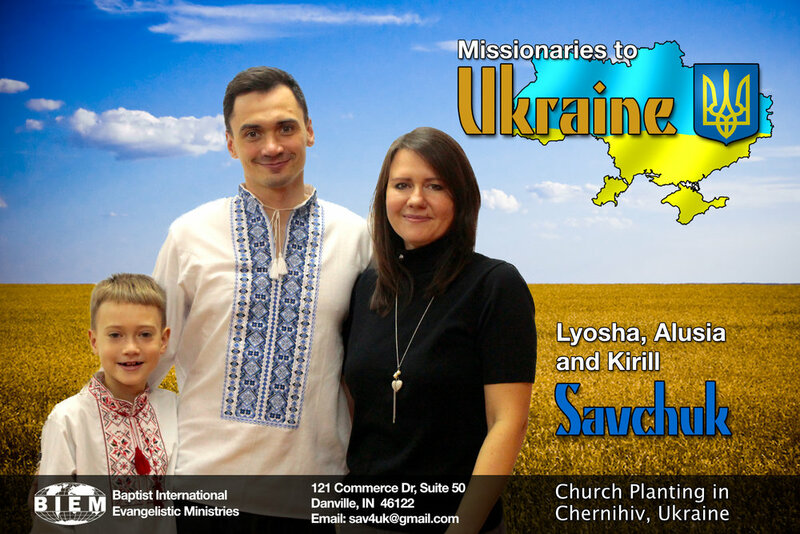 Pavel Usach is a dedicated Ukrainian believer whose ministry particularly focuses on evangelistic outreaches for children and youth. In addition to ministering in their own church in the town of Zdolbuniv, Ukraine, he and his wife minister in local orphanages and summer camp ministries. Also, he is the originator and main coordinator of an annual competition called Bible Quest, which draws teams of Christian teens and young adults from churches all over Ukraine. The teams competing in the Bible Quest prepare by studying a given book of the Bible in advance and in intricate detail. Then, during the Quest, teams make their way to different stations scattered throughout a forest and must apply this Bible knowledge to fulfill various challenges. Over and over, these Bible Quests have served to deep youths’ knowledge of the Scriptures, to provide a chance to meet and fellowship with other Christian young people, and ultimately to deepen their Christian walk. For more information about the Usachs and their ministry, please contact our office. Vitaly Yurchenko was working on a nearby roof when he witnessed the explosion at Chernobyl. A fortunate survivor of this nuclear catastrophe, Vitaly is a graduate of the Kyiv Theological Seminary, and he gave up a lucrative private business to become a church planter with BIEM. When Vitaly first visited Chervona Sloboda, Ukraine, there was not so much as one church of any kind, and he felt the Lord urging him to start one. Beginning by renting the village club and holding evangelistic meetings, he has been blessed by God as souls have turned to Christ as Savior. Vitaly now leads a congregation (called Grace Baptist Church), which purchased a house to remodel and expand as their own meeting place. Despite open hostility from two community leaders (the school principal and the manager of the liquor distillery), Vitaly steadfastly persevered in proclaiming the Gospel, and the Lord is blessing his faithfulness.